Said to have borne witness to the first mass in the nation's history, Santa Cruz Cabralia in many ways stands as a quintessential coastal Brazilian city. Santa Cruz Cabralia is known for beaches, outdoors, historic sites, nature, and museums. Your plan includes some of its best attractions: kick back and relax at Coroa Vermelha Beach, browse the eclectic array of goods at Feirinha das artes, stroll through Lencois Beach, and look for all kinds of wild species at Fazenda Mae Tereza. Before you visit Santa Cruz Cabralia, use our trip planner to discover what you can do and see there. Rio de Janeiro to Santa Cruz Cabralia is an approximately 2.5-hour combination of flight and taxi. You can also drive; or do a combination of bus and taxi. In March in Santa Cruz Cabralia, expect temperatures between 34°C during the day and 26°C at night. Finish up your sightseeing early on the 10th (Sun) so you can go by car to Porto Seguro. In a sense, Porto Seguro is where Brazil as a country began, marking the spot where Portuguese explorers first arrived in the 16th century. Porto Seguro is known for beaches, historic sites, museums, nightlife, and theme parks. Your plan includes some of its best attractions: make a trip to Mucuge Street, take a leisurely stroll along Passarela do Descobrimento, kick back and relax at Praia do Espelho, and get in on the family fun at Eco Parque Arraial d'Ajuda. For more things to do, traveler tips, reviews, and tourist information, use the Porto Seguro trip planner. You can drive from Santa Cruz Cabralia to Porto Seguro in an hour. 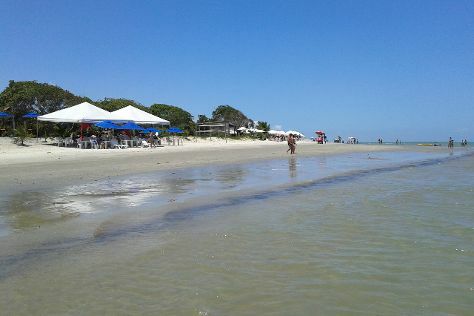 In March in Porto Seguro, expect temperatures between 34°C during the day and 26°C at night. Finish your sightseeing early on the 17th (Sun) to allow enough time to fly back home.